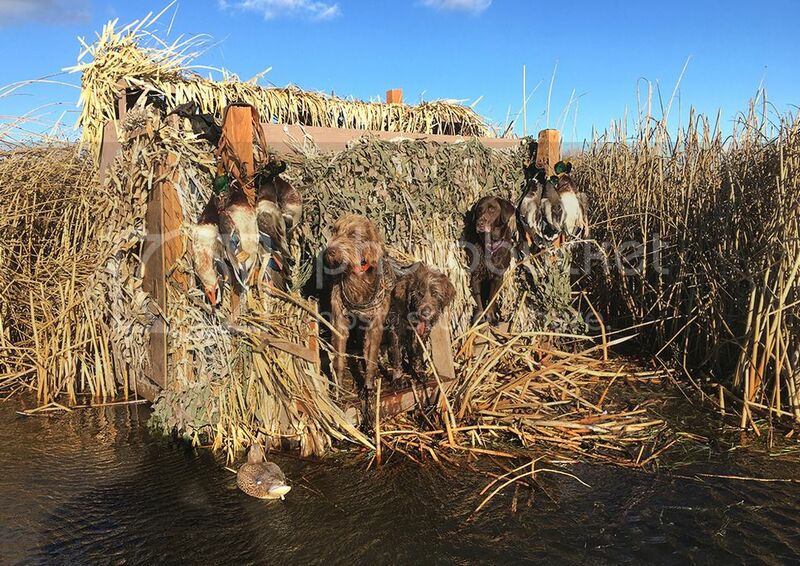 VersatileDogs.com • View topic - Getting a 4 in duck search. Getting a 4 in duck search. Re: Getting a 4 in duck search. The purpose of training a dog to handle is to control its search. The reason a trial or test ret fails its blind is because it breaks down into a search. I know where the bird is, I need to send the dog there. Ret are very independent, we train to control the independence and put the nose where the bird is most likely to be. I look at the pics and I see a huge problem if I cant handle. Exactly where is the dog to starch its search. Why would i send the dog to search if I don't have 1) an idea that a bird is down,2) an idea of where a bird went down? I cant tell for sure how far the edge of the cover goes , but 1) if the dog doesn't see the bird go down, being able send it at least in the likely location of the fall ch to start its searis unquestionably better than "just go look for it". 2) if the dog did see the bir dog down,then a dog well trained at marking will have a superior chance of getting to the area of the fall and finding the bird. The only applications for "search" are, my friend shot a duck here this morning and I have I no idea where it is, can your dog find it? The reason we are "searching" for game, is that we know we shot something. Send the dog to where the bird went down. 99% of the time thats where the dog will pick up the scent. Very basic handling skills are all that are useful in those marshes. Yes of course you need to be able to send the dog in the right direction. But once the dog enters that cover no further handling is even possible due to no line of sight, so a dog with a great independent search is what is needed to recover the game when hunting there. In 45 years of water fowling I have seen approximately 10 birds recovered due to good marking and or independent search for every one recovered due to long range blind retrieve handling skills. Some of that is a function of where people hunt. The more open water you hunt the greater the opportunities for long range handling. I think a complete dog needs to have both independent search and basic level handling skills as I stated before. The OP postulated that his style of chasing cripples when jump shooting ducks was very useful to his dogs learning to do Duck Searches. 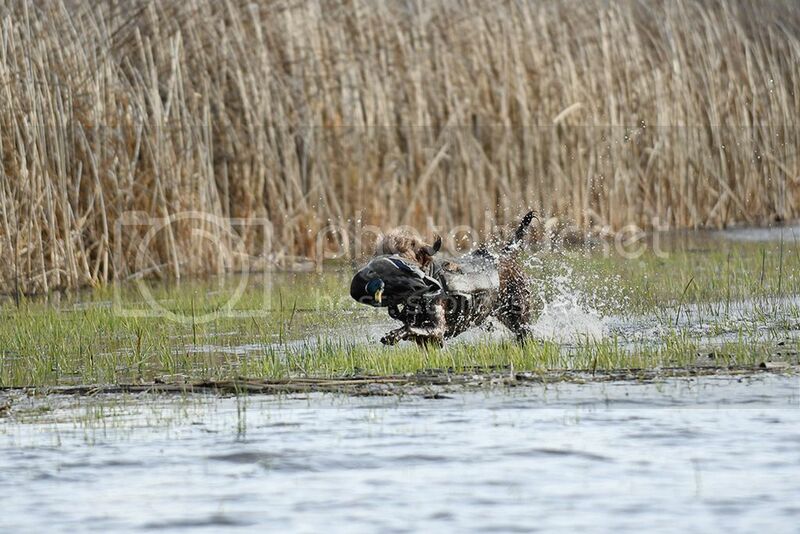 Others commented their dogs actual hunting experience was not at all helpful to the Duck Search in a test because the Duck Search was a very artificial exercise having little correlation to their actual duck hunting. Where I hunt the Duck Search looks a great deal like our actual hunting conditions (as I thought was self evident in the photos). Kiger2 wrote: The only applications for "search" are, my friend shot a duck here this morning and I have I no idea where it is, can your dog find it? In Germany, the primary use of a versatile dog is game recovery... it is the Federal law that you need a certified dog in order to even lease land for hunting. The "search behind the duck" is specifically for the purpose stated above. Like I posted earlier, we release our pup to search the impoundment on the way back to the parking lot, and we usually recover birds shot by other hunters. These tests are not about the scores. These tests are about game conservation! A good versatile dog should search water in the same manner as a field, period. Completely and efficiently such that no game is lost. A friend of mine was on a duck hunt in Germany. They started shooting at sundown and continued to dark. 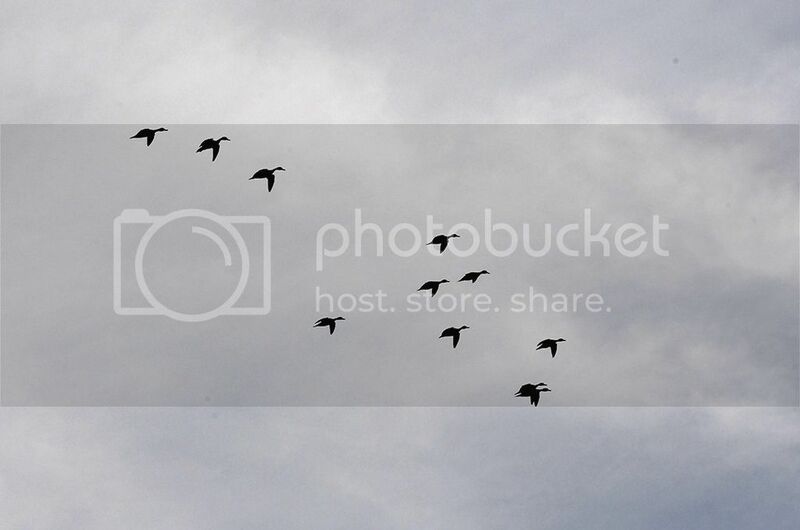 During the shoot, the ducks are left where they fell and the shooters kept track of how many ducks they shot. When the shooting was done, the dogs were sent in the dark to get the ducks. They shot 300 ducks and they where there for hours as the dogs retrieved all the birds in the dark. Average: The duck search swamp we have in Washington isn't anything like your photos. It's nothing but pure swamp in the woods. Lots of junk in the water before the dog gets to the real search area, no open water. I haven't been there in a few years but I assume it looks the same as before. Some dogs have difficulty just getting to where they need to go to begin the search. A dog that won't take a line and disappear into the cover on the far side for a while, isn't going to get a 4. Have seen a lot of dogs fail because they don't use the allotted time. Orhunter, the pool in the smartweed marsh was 20 yards at best across - 50 yards lengthwise. So very little open water. The setup in the flooded corn had a bigger pool - about 45 yards to the front and 75 yards lengthwise but standing corn beyond that and a large flooded/frozen area of standing corn immediately to our back as evident in the photo. So would seem a lot more similar than dissimilar to the swamp you describe, in terms of needing a dog willing to search into cover independently. Yes they need to be sent in the right direction but that does not require Retriever FT level of training, and most importantly the dog had better be willing to search on its own once it hits the cover. The application of needing a dog to search independently in those marshes goes way beyond "my friend shot a duck down and now needs my dog to recover it". Even with marks a crippled duck is going to move through that thick cover quickly and the dog needs to be very willing and determined to continue its search without further guidance from the hunter until the job is done. And it is common for a dog to not get a mark on every downed bird when two or more people are shooting over the same decoy spread. I will take a little handling and a lot of search every time in my dogs. I think the Germans got the Duck Search right in testing for what I find to be the most critical skill and I think the 4s come from dogs which had the necessary drive bred into them vs trained. orhunter wrote: Average: The duck search swamp we have in Washington isn't anything like your photos. It's nothing but pure swamp in the woods. Lots of junk in the water before the dog gets to the real search area, no open water. I haven't been there in a few years but I assume it looks the same as before. Some dogs have difficulty just getting to where they need to go to begin the search. A dog that won't take a line and disappear into the cover on the far side for a while, isn't going to get a 4. Have seen a lot of dogs fail because they don't use the allotted time. Therein lies the difference between the evolution of the NAVHDA "test" dog and the intent to which the JGHV intended for a "hunting" dog. The concept of handling, sending on a line, etc. Americanized the situation. In a hunting situation ALL of the cover is the objective to be searched, not just the "ducky" area. It's the performance that Chadwick described. I've seen many "4" searches in JGHV tests... But, I've only seen a handful of real life "4"s or "12"s, (one or two from dogs that I've judged). A buddy in my club has one of those dogs... a dog that as soon as she clears the tailgate will search every square fort in any swamp, pond, or lake without a command. She simply searches every kind of cover with the same desire as a field... and, he too comes back with ducks that his party didn't shoot! We don't necessarily see these dogs on the score sheets. In my mind, there are "test 4"s and then there are "4"s.
It is common for both dogs in the photos I posted to find birds I did not shoot in those marshes. The pup went exploring while we were setting out the decoys on our last duck hunt and came up with a drake GWT buried in the cover. I watched a number of dogs go into this swamp only to come back fairly quickly and then had to find another route to hunt (if they had it left in them). After the test I stripped down and waded over my waist out into the swamp and found that the channel all the dogs took was blocked about 50 yards out and the dogs couldn't get through, and I'm sure no judges or handler even had a clue. This put the dog back in the lap of the handler and then the dog had to figure out a way to go out past the obstruction and thus most failed the test. There are very few 4's in duck search at this location and hence it's a bad test. On the other hand, a dog that's driven to hunt will probably find a way. Of course a dog should hunt. But it is just stupid to see a bird go down that the dog didn't and not be able to send the dog promptly to the area of the fall. Remember the cripple is getting away! Get the nose there. The nose will get the bird. Kiger2 wrote: Of course a dog should hunt. Yeah but why do you seem to think someone with a versatile dog would send the dog on a random search IF it had seen the duck go down? The duck search is a search for a duck that neither the handler or dog has seen. No one but you is suggesting a dog should ever be sent to search in the wrong direction when either the hunter or the dog have a mark. I have said at least twice in this thread that a complete dog needs to have basic handling skills. A cripple dropped well back into either one of those marshes I (and many others ) hunt, will result is some degree of duck search by the time the dog gets to the fall. Even dead birds will result is some searching as neither hunter nor dog can maintain line of sight on their mark once they enter the cover. That smartweed was extremely thick, tall and flooded, it takes a dog with a lot of drive to keep going and searching in it. Exactly the skills trained and tested for in Duck Search. You keep talking about handling a dog to the mark when the photos clearly show the reality is you and your dog cannot even see each other once the dog enters the cover, which is only 20 to 45 yards away depending on the pool opening we are hunting. Hence why I know from hunting those marshes the Duck Search skills used in the test are absolutely needed to recover ducks in those marshes. Far more often than an ability to handle a dog via hand signals at long distances will ever be used in those marshes. I agree that duck search skills are really important, at least where I hunt. This blind backs up to solid reed canary grass that’s over your head and flooded up to your thigh, and is hardly penetrable by man. Out front there’s 150 yards or more of manageable ground and water where the dog can mark easily or you can handle the dog to the fall if he doesn’t see it. But you really try to avoid dropping a bird behind you because only dogs that can hunt totally on their own for long periods of time will ever find a bird there. If they can mark it (or if you can mark it), there’s an improved chance to get the dog going in the right direction. Anyway, in order to maximize game retrieval I think the dog needs some handling skills but also needs to be able to hunt independently. It’s nice to have a breed who’s natural desire will get it 4 in duck search because when you start putting handling skills on the dog you run the risk of making it more dependent on you so I think you need to train for both. I've gone overboard both ways. Thank you fellows for all the very insightful reply's. I'm amazed at the ability to take pictures while hunting, a wonderful ability. I took from this that the water tests are very different depending where on the continent you are running the test. The member from Washington is right the water in the Pac NW is everything he says. In our test in Alberta, my dogs both found ducks, the first one retrieved the duck alive to hand, the judges had a quick meeting (it took her about 7 mins) and decided that they had seen enough. What doesn't show up in the score sheet is that before she was sent, she had crouched down like a sprinter and at the word "back" she hit the water about 20 yards out and didn't wet her back as she headed to the bulrushes. If the judges wanted her to go again, we might have been there until dark. If she knows there are ducks out there, she'd want them all! I liked the observations that the young fellow who was helping the old fellows with waders and the mud, on behalf of all senior citizens, thank you. He figured out that it is best to take advice from the trainers who have successful dogs, never forget that. Just BTW my dogs handle a bit, back, over and lining, I have never taught "stop", if she looks back for help and I think I know where the bird is I do help but not in a test. Thanks for all the information and polite responses. A well rounded duck dog can mark well. Root a bird out of cover when location is unknown. It can also be handled on blind retrieves. You can load up the decoys, shotgun, and the dog and go. Wherever you end up, the dog has the tools to deal with it. I agree with Averageguy that most retrieves do not require much handling. I have watched birds sail a long way through bad stuff on more than one occasion, then watched a good dog go root it out. That part should come pretty natural. I have also seen a bird sail waaay long, and heard the comment "that bird is gone" from hunters with dogs. Then watched someone who has been sitting back and watching the dogs work, stand up, heel and give their dog a line, then send it. Low and behold the dog who has been pretty much hunting on its own all morning, shifts gears, works in cooperation with the handler, and does things at another level, to retrieve a bird it otherwise would not have got. It takes a well bred dog with plenty of hunt and trainability. That is a balanced dog. When a dog loses its balance or has the "hunt trained out of it", it is anticipating incessant hacking, and has not been allowed to "hunt it up" enough. That is a training/handling issue. It is the same as a pointer that is hacked on till it won't range past where you would expect a flusher to work.